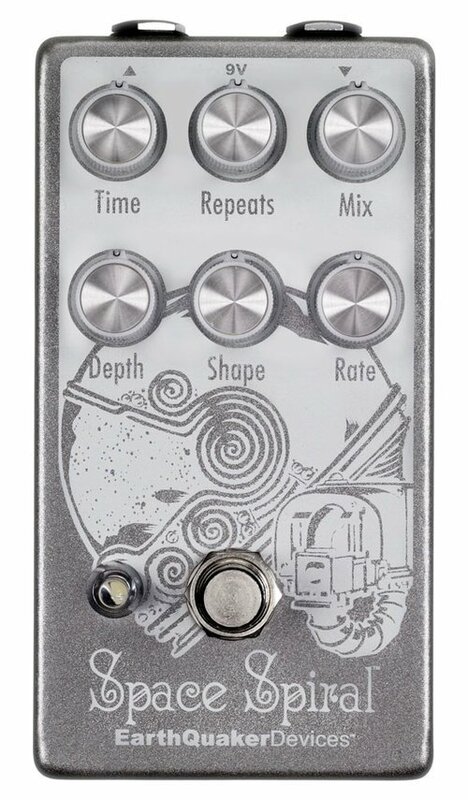 The Space Spiral is a dark and dreamy modulated delay designed to take you across the highways of fantasy. While the delay may be designed around a “dawn of digital” echo processor, the sound is out of this world, man. If you are a fan of the dreary echoes produced by old oil can delays or the ethereal sound of a well-loved tape delay, the Space Spiral is totally going to tickle your tone bone. The Space Spiral’s delay time ranges from a tight 30ms to a fast and loose 600ms. Can you imagine having 600ms of delay time at your fingertips? Out of this world! With all of this adjustable delay time you create anything from a classic slapback to a rhythmic wash of cosmic proportions. You want to take it even further? Maybe to an astral plane? Crank up the repeats and let the infinite oscillation of the Space Spiral take you to the other side. Space Spiral™… It’ll get you through the night. Pro Tip: If you have the repeats all the way up into self-oscillation territory, tum the delay time to alter the frequency. Repeats: Controls the regeneration of the delay signal. Repeats increase clockwise and gradually begin to build into self-oscillation around 3 o'clock. This oscillation will infinitely continue until the Repeats control is brought back down below the 3 o'clock threshold. These oscillations will last even when the pedal is in bypass mode. Rate: Controls the speed of the modulation; Clockwise for fast and counterclockwise for short.. Pro Tip: Match the Rate to the delay time (or a subdivision) for some cool rhy1hmic effects. This is especially awesome in square wave mode with the depth set high.